Mojo has just received an infusion of crap from her sainted Favorite Mother, who, despite Mojo's constant libels on the Craptacular and the mojocrap blog, continues to count Mojo as one of her four children, albeit the Forgotten Middle Child. All communications with the Favorite Parental Units seem to indicate that Mojo is still in the will, which frankly somewhat surprises Mojo, but she is smart enough not to look a gift horse in the mouth. Perhaps because Mojo, unlike all the other siblings, has actually taken it upon herself to find a bagpipe player and has already commissioned said unfortunate acquaintance to play at her Favorite Mother's funeral when that unhappy time should come to pass. (My mother was actually there when I proposed the scheme, and what's the poor bagpipe player to do when face to face with Mojo's Mother and asked if she will play at her funeral? Say "No" right to the someday-deceased's face? I don't think so! So Mom has her bagpipe player and Mojo remains in her Mother's Good Graces. Whoohoo!) So Mojo has agreed to sell some of her Favorite Mother's crap on eBay, in the hopes of worming her way even further into her Favorite Mother's good graces at the expense of Certain Lesser, Uncaring Siblings. 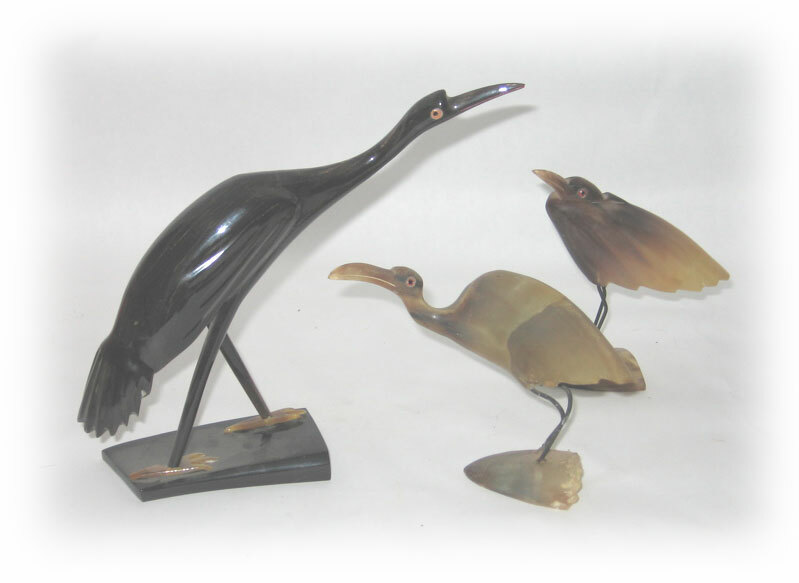 Read more about Animal Horn Bird Sculptures! Cutest Puppet Bath Mitts EVER! Loyal Craptacular readers know Mojo is not one to gush. Instead she enjoys picking things apart and finding hidden faults and crowing about them in public. For some odd reason Mojo's friends, if it can be said she has any, tend to react badly to this endearing quality, but as Mojo likes to point out, she does it with Love and Respect. Because Mojo loves and respects herself, you see, and when she criticizes others it makes her feel even better about herself. Which is all-important for her fragile Self-Esteem. 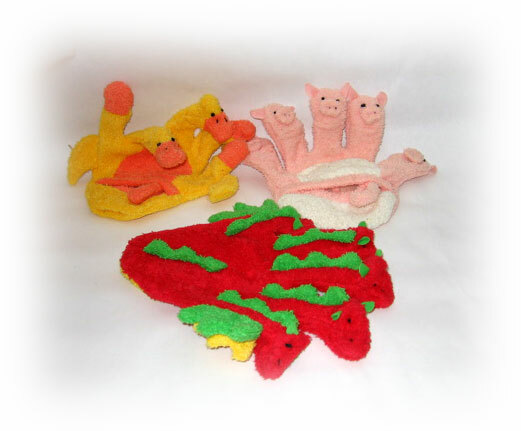 Read more about Cutest Puppet Bath Mitts EVER! Toy Week continues here on the Craptacular with a new twist on an old favorite. 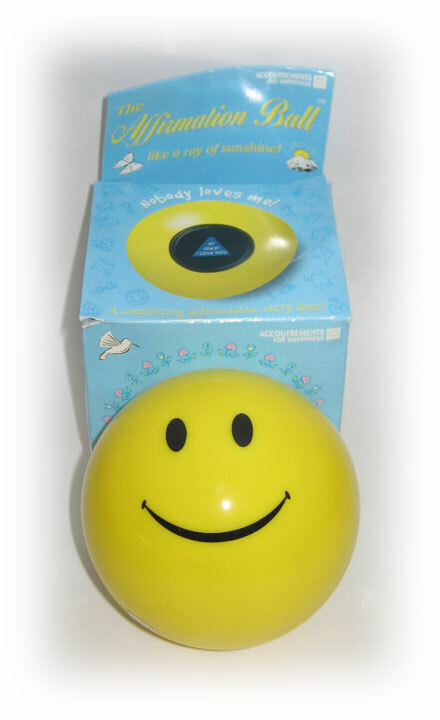 Everyone who was anyone had a Magic Eight Ball when they were kids. Which is probably why Mojo did not have one. Sure, all her friends had a Magic Eight Ball, so Mojo could consult the spirits or Minnesota Fats or whoever it was that was conjured with the use of said Magic Eight Ball. But she herself never owned one. 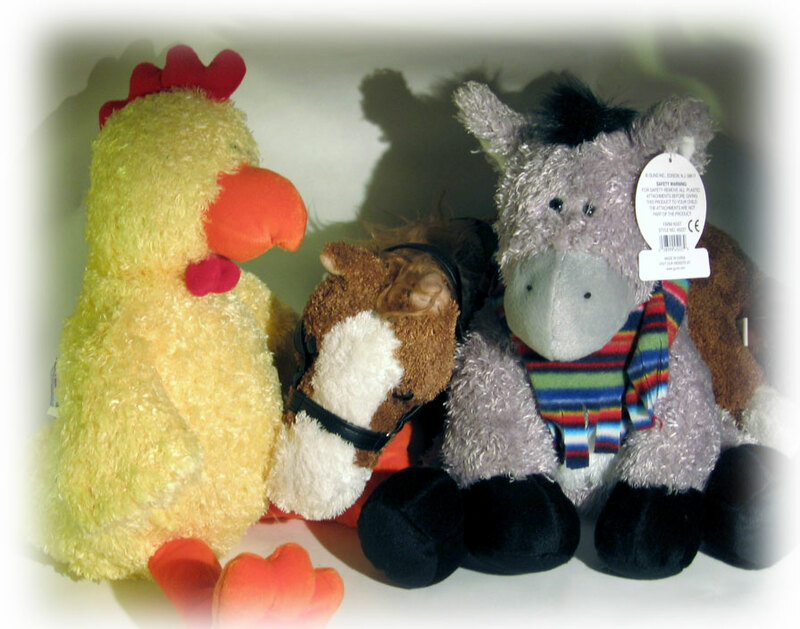 She wasn't deprived--at least not in this instance; just don't ask her if her parents ever got her a pony, though, or you're in it for the long haul--but she just never got around to buying one for herself or receiving one as a gift. Read more about Affirmation Ball! What is evidently turning out to be Toy Week continues with another blast from the past! Mojo is again shocked this did not sell. You'd think she'd be used to it by now, but instead she takes it totally personally and after she has finished sobbing out her eyes she plots her revenge while poring over the old description, wondering what might have gone wrong. Like this marvelous brain-building musical mat for your wee bairns. Perhaps calling it "annoying" may not have been the best choice of works to describe this item. So instead of blabbing on about how smart and precocious Mojo was when she was a tot, instead I will instead waste your valuable time and divert your attention from the item in question by describing the very first paying job I ever had. Which was being a toy tester for a certain nationally-known toy manufacturer who resided just one town and one state over from where Mojo grew up. Read more about Brain-Building Mat for Tots! As those who know and love her best can attest--and they had darn well BETTER attest if they know what's good for 'em--Mojo can be generous to a fault. She is always buying presents for the young people in her life, as the exasperated parents of spoiled children know all too well. Mojo wants to be known as a "fun" adult, so she likes to buy things for her young charges and acquaintances so that she can then play with the toys by pretending she is playing with the child. And since usually she can outwit and/or outmaneuver a three-year-old, it is not too difficult to play for hours with their toys while they are stuck with an empty box. It's all part of making sure it is an appropriate toy for them. Because for Mojo, the quality of the whole experience is everything. Read more about Plastic Bag o' Critters! So people sometimes ask how Mojo got her name. Mojo was always "Jo" to her family when she was growing up. "Jo" is very simple to remember, and so long as you don't append an extraneous "e" on the end it's easy enough to spell. But the Favorite Younger Sister, who was an animation professional, was friends with Certain People at the Cartoon Network, and a big fan of the Powerpuff Girls. Your friend Mojo, who lives out in the sticks and consequently cannot get cable, high speed internet access or any other basics of simple living without a special act of Congress. So she has only seen the PPGs through her Favorite Younger Sister's tapes and DVDs. She does not even know if they are still on the air. But she liked them well enough, what little she has seen of the show. Enough that Mojo herself wrote to her Favorite Younger Sister's friend at the Cartoon Network and started up an occasional pleasant correspondence with this individual. Which has nothing whatsoever to do with this story, but just goes to show you how Mojo will talk to just about any victim who is unfortunate enough to cross her path. 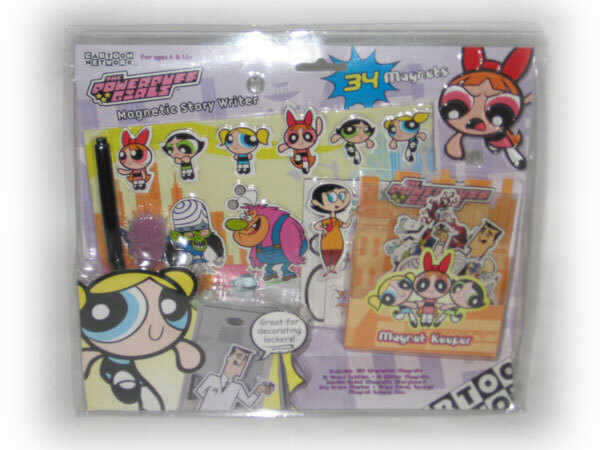 Read more about Powerpuff Girls Magnets!